Game Gear cartridges can not be played on either the Sega Master System or the Sega Genesis, since the Game Gear has the ability to produce more colors than either system can handle. As a result, any kind of “Super Game Boy” type of converter is impossible, but software patches are being created that allow this to happen. – Use Lunar IPS to apply the patches to your rom. There are sometimes disadvantages, such as palette issues, screen artifacts, or glitches, but if you already own a rom cart (or can flash your own cartridges), it’s an excellent way to experience those games on a big screen! I had always hoped developers would push the conversions a step further and patch GG games for use on the Genesis (instead of the SMS) to utilize the Start button and stereo sound could be utilized. 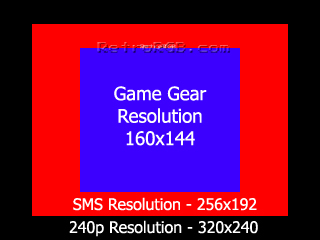 Although a bit ridiculous, it might also be possible to directly patch Game Gear games to 32x roms to utilize the extra colors the 32x supported. Please head back to the main Game Gear page for more information. Sega Game Gear (BLUE) Good Working Condition With Power Cord And Game ! SEGA Game Gear Backlit Backlight Back Light SHIPS FAST!